On the Korean peninsula, turning your music up too loud could literally mean war. Last week, South Korea formally accused North Korea of launching a torpedo on March 26 that sunk its warship Cheonan, declaring "psychological warfare" in retaliation. Ending a six-year suspension of state-sanctioned propaganda toward its northern neighbor, the South transmitted its first FM radio broadcast across the border on May 25. Its first message to the Hermit Kingdom? A South Korean pop song. Technically, the two Koreas still are at war. The Korean War of the early 1950s concluded with an armistice in 1953 that divided the peninsula at the 38th parallel, now home to the 155-mile Korean Demilitarized Zone, better known as the DMZ. The last five decades have been marked by a recurring cycle of flare-ups between the clashing neighbors, and the DMZ remains the most heavily guarded border on the planet. The 38th parallel is also where most of the self-aggrandizing exchange between the two countries takes place. Both sides have set-up "peace villages"  propaganda campaigns thinly masquerading as cities  on their sides of the border. From here, North and South periodically trade taunts through structural showdowns. During the 1980s, South Korea erected a 98-meter flagpole in its peace village, Daeseong-dong. North Korea responded with a 160-meter flagpole  the tallest in the world  in its border town, Kijong-dong. In 1998, the South built the Freedom Building in the DMZ's Joint Security Area to hold talks for families separated by the war. The North countered this by adding additional stories to its own Panmun Hall. In addition to its aural and architectural methods, South Korea has also engaged in traditional paper-based propaganda. During the Korean War, Seoul showered the North with anti-Pyongyang leaflets, dropping more than two billion of them over the course of the conflict  enough paper to cover a landmass 20 times the size of the peninsula. The effort continued into the Cold War, with leaflets enticing possible defectors with photos of the famous South Korean actress Won Mi-kyung and promises of riches. 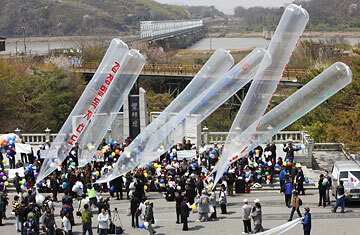 Beginning in 2003, South Korean activists took matters into their own hands, dispatching balloons stuffed with millions of leaflets for their North Korean counterparts. According to reports, Seoul has considered reviving the tactic in the current confrontation, but has delayed the move due to inclement weather. It has also threatened to mount giant loud speakers along the DMZ to blare anti-Pyongyang rhetoric across the border. Though balanced by a stern speech by South Korean President Lee Myung-bak, admonishing North Korea for sinking its naval vessel, South Korea's re-inaugural broadcast began with a song by the popular K-pop girl group, 4minute. Their song, "HuH (Hit Your Heart)," was chosen as a shot at the North's oppressive regime. "Baby, you're kidding me? I do what I want and I do it my way," the girls purr, flaunting the South's prosperity and freedom of expression to its impoverished northern counterpart, complete with a thumping beat and sultry dance moves. But as with most of the Koreas' clashes, the South's latest barrage of propaganda has been tempered by the hesitation to pull its reclusive northern neighbor out of its asocial shell and into all-out war. Nobody wants another war on the Korean peninsula  not even the pugnacious North  and some believe this latest bout of brinkmanship may simply be for show. Senior South Korean officials have said they need to reassess the current situation before proceeding with either their loudspeaker or leaflet tactics; meanwhile, Pyongyang has sworn to destroy any speakers the South sets up along the border. Maybe K-pop isn't their thing. See pictures of the New York Philharmonic's historic concert in North Korea.